Bumthang has many accommodation options ranging from ultra-luxurious to basic. Most of the options are around Jakar town while a few are centered in villages. The AmanKora lodges are experiential ultra-luxurious getaways and the one in Bumthang is right next to the Wangdicholing palace in Jakar. 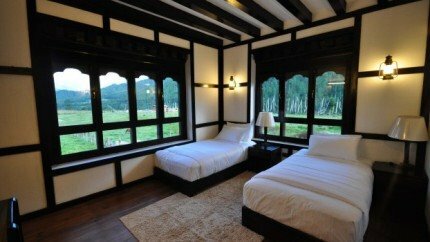 There are 16 suites in Amankora Bumthang and the reservations are mostly made online. Every suite has a traditional bukhari, window seats with Banquettes, luxury beds, terrazzo bathtubs, luxury vanities and antique fittings. There are sister Amankora lodges in Gangtey, Paro, Punakha and Thimphu and you can choose to stay in them for the entirety of your Bhutan trip. Should you wish to spend more than 7 days combined in these lodges, you will get a tailored tour plan with road permit arrangements, drivers, guides and a complimentary hour long spa service. Life retreats comprising of meditation, spiritual discourses and temple visits are held in Amankora luxury lodges and they will be held between 21st may 2017 to 11 September 2017. The Amankora hotels are all equipped with minimalistic elegant designs and the food as well as service is excellent. The hotel staff will arrange bikes, hiking trips, sightseeing tours and even helicopter drops for guests. The rates at Amankora per night start at 1550 USD (there are rebates on online bookings and package deals). This resort has a lot of Gothic charm and its antique beauty will appeal to tourists who are fans of “old world beauty”. The location on a hill top is picturesque (and quiet) and you can see the amazingly lovely Bumthang valley spread out in front of you. The staff is polite and courteous and the food is flavourful. The rooms are clean and beautiful but there are some issues with the plumbing at some places. The approach road to the resort is very troublesome and there are no lifts in the hotel. Tariff of the suite per night is 7150 NU plus taxes. This is one of the very few hotels in Bumthang with modern amenities. This lodge is more like a luxury resort and it is owned by the prestigious Himalayan group of Hotels. There are only 9 lovely rooms with spacious attached baths. All rooms have twin beds and large cabinets along with hair dryers and room heating along with a tea/ coffee maker. The room rate is between 3500 NU to 5000 NU plus 20% tax. This is one of the best moderately comfortable accommodation option in Bumthang. The rooms have a somewhat Swiss style décor as its owned and managed by the same swiss guy who operated the cheese factory and Red Panda brewery. there are facilities for airport transfer, foreign currency converter, laundry storage, library and wi fi. There is an in-house restaurant serving swiss and continental apart from Indian food and its well known in Bumthang region. If you want to experience the feel of staying in a cosy little farmhouse in idyllic surroundings, then you will love the Chumey valley resort. The resort stands against a backdrop of cypress trees and has double storeyed cottages along with a main block that has standard rooms. Enjoy the comfort of super-sized beds, electric fire places and rather nicely decorated washrooms. The cottages have kitchenettes and you can rustle up some basic dishes. The staff is courteous and do their best to please though the menu options are limited. Special features include a meditation room and a radio club room. The standard rooms are priced at 2060 NU while the suites are priced at 3850 NU plus taxes. For a guest house, the facilities here are very nice as it has a currency exchange cell, taxi service, mini library and free wi fi zone. The rooms are beautifully decorated with traditional Bhutanese furniture and outside there are wall carvings representing Bhutanese heritage. There are 14 standard rooms (tariff is 2255 per night) and 12 luxury rooms (tariff is 3795 per night). There is an in-house restaurant and bar inside. The balcony commands an excellent view of the nearby mountain ranges and there is adequate room heating. The furniture is pleasant though not noteworthy and the services are just adequate. The food is also not exceptional though you get room service. There are 18 standard rooms and 15 deluxe rooms. The standard room tariff is 2500 per night while the Deluxe room tariff is 3500 per night. If you want to experience tranquillity in its purest form, then Shingkhar retreat that is situated in the isolated Ura Valley may be to your liking. The Jakar town is 2 hours away so there is little scope for fine dining and shopping nearby. The Hotel has its own spa, fitness centre, meditation room. Library etc. There is a multi-cuisine restaurant and bar inside and they serve continental along with Bhutanese and Chinese. There are only 7 rooms available and the room tariff ranges between 1800 NU to 2300 NU per night plus 20% tax. Other notable hotels in Bumthang include Samyae Resort (In Kethpaling), Rinchenling Lodge (In Tashigatshel), Dekyll Guest House (Jakar) and Jakar View Guest House (In Jalikhar).